Polygonum hydropiperoides of Michigan Flora. Swamps; bogs, fens, and ditches; borders of lakes, ponds, and rivers; often in shallow water. A variable species or complex. No Michigan specimens have spreading to ascending hairs on the ocreae, said to characterize P. setacea (Baldwin) Small, though otherwise, pubescence is highly variable. Plants from throughout the state may bear on the leaves flat, plate-like, pale, easily dislodged, sparse and irregularly spaced “glands” resembling the farinosity of some Amaranthaceae. 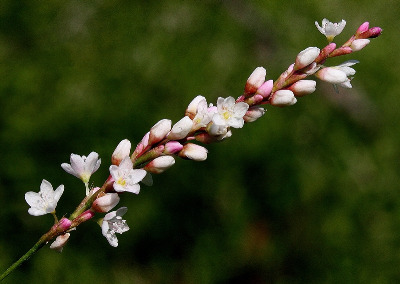 Fewer plants bear these on the perianth, which would make them referable, according to some authors, to Polygonum opelousanum Riddell var. adenocalyx Stanford; a narrow-leaved (< 1 cm) entity with a restricted distribution. However, specimens with abundant glands on the calyx (especially a few from Berrien and Cass Cos.) include narrow as well as broader (to 2 cm) leaved plants. This group clearly needs additional study in the state. The flowers of this species often appear open in the field, while in our other smartweeds the tepals generally remain closed. MICHIGAN FLORA ONLINE. A. A. Reznicek, E. G. Voss, & B. S. Walters. February 2011. University of Michigan. Web. 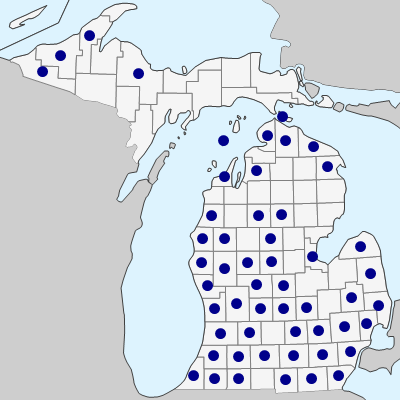 April 22, 2019. https://michiganflora.net/species.aspx?id=2283.